A £100m saving for the Northern Ireland taxpayer is being squandered because the only item government agencies could agree to jointly purchase over the last 10 years was photocopying paper. And Northern Ireland Auditor General Kieran Donnelly has questioned why Stormont departments have only pledged to try to save a mere fraction of a potential £140m it could recoup if it adopted the use of interdepartmental spending agreements already being effectively used in Scotland, England and Wales. Northern Ireland’s economy is heavily dependent on the public sector, with an annual budget of £11.5bn and a workforce of 225,000 people. However the global recession means that Northern Ireland’s public sector faces budget cuts of 8% in recurrent expenditure and 40% cuts in capital expenditure between 2011/15. 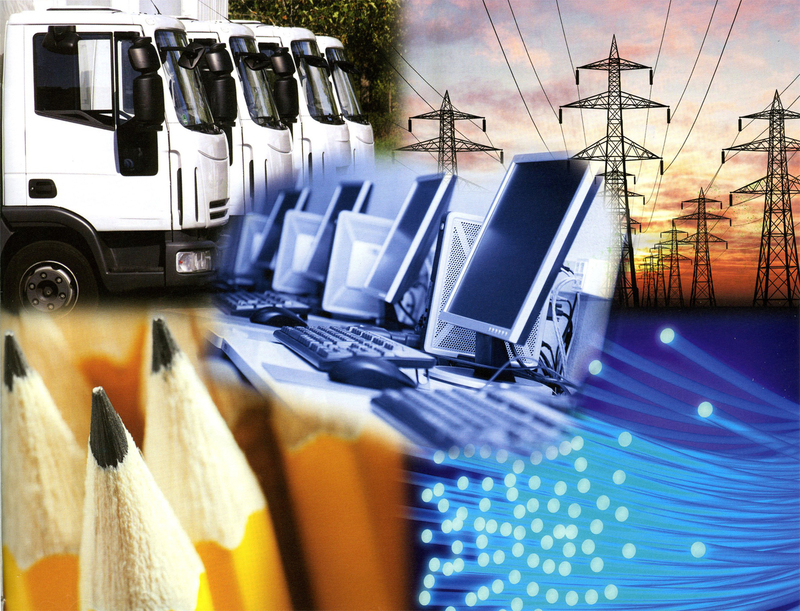 With an annual budget of £2.7bn, procurement in the public sector is recognised as a source of potential major efficiency savings if government agencies work together to purchase goods and services more competitively. Almost £900m is spent each year on common goods and services in government departments and their arms length bodies (ALBs). However the new Northern Ireland Audit Office (NIAO) report has found repeated failings in the public sector’s efforts to achieve value for money in the purchase of mutual goods and services. The collective buying of goods and service within public services in Northern Ireland is governed by a Procurement Board, which is responsible for the development of policy and practice and is chaired by Finance Minister Sammy Wilson. The board is supported by a Central Procurement Directorate (CPD) within the Department of Finance and Personnel (DFP) and a number of Centres of Procurement Expertise (CoPEs) within Roads Service, NI Water, Translink, health boards, education and library boards and the Housing Executive. However auditors found that CPD had no information on the annual spend on commonly procured goods and services, had failed to share information across CoPEs and had no forward plans on procurement. Auditors found that between 2010/11 CPD only managed to achieve 4.3% (£38m) on collaborative spending between public agencies for goods and services. Despite a Northern Ireland Procurement Policy being agreed in 2002 auditors found there has been little progress made in agreeing joined-up policies between departments with no formal strategy, detailed action plans or specific targets to generate savings for the public purse. In 2004 CPD formed a Public Sector Collaboration Group (PSCG), which consisted of representatives from CPD, CoPEs and OGC (Office of Government Commerce). The PSCG group identified a number of potential common collaborative opportunities. However, as the arrangements were not mandatory, departments were reluctant to take on procurement on behalf of all departments. By 2007 the PSCG had been disbanded. The Stormont Assembly’s Programme for Government (2008-2011) introduced Efficiency Delivery Plans (EDPs). Departments were to produce EPDs to include efficiencies from collaborative procurement with an estimated £20m in potential savings between 2011/14. However auditors found little evidence of collaboration between departments. The only cross-departmental agreement on collaborative spending across the entire Northern Ireland public sector demand was a photocopy paper agreement. 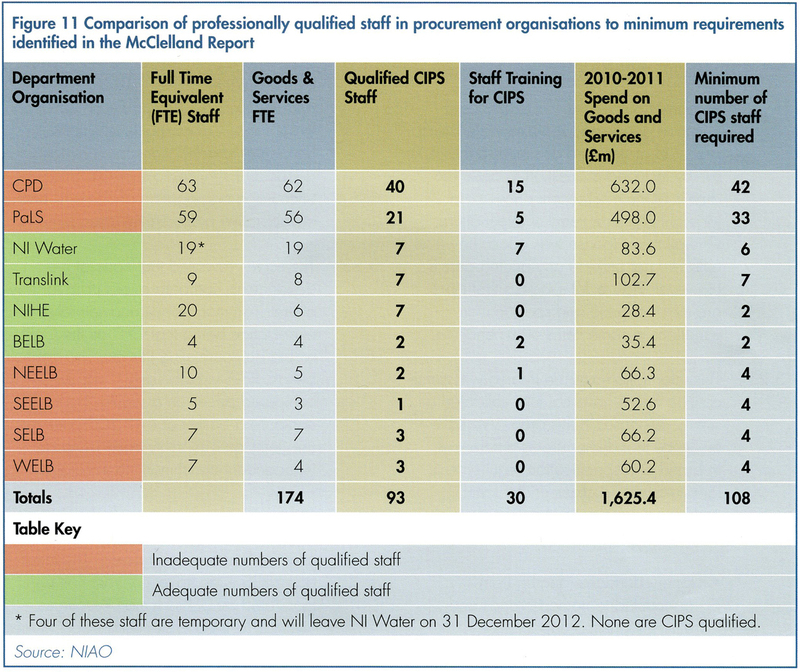 Between 2005 and 2011 CPD estimated that it had achieved efficiency savings of £35m. Auditors described the saving as a “very modest achievement” in comparison with other regions. England, Scotland and Wales were found have set more challenging targets for savings from collaborative procurement initiatives. Scotland has set a target of 5.3% over three years. If the same target was set by Northern Ireland it would see a saving of £140m – £105m higher than currently proposed. An audit office examination of how public bodies compared on eight areas of spending revealed major variations. The survey revealed “very limited price benchmarking” and how a number of Arm-Length Bodies (ALBs) are paying more for goods and services than their parent government departments. “A number of Arms-Length Bodies appear to be paying more for some common goods and services. 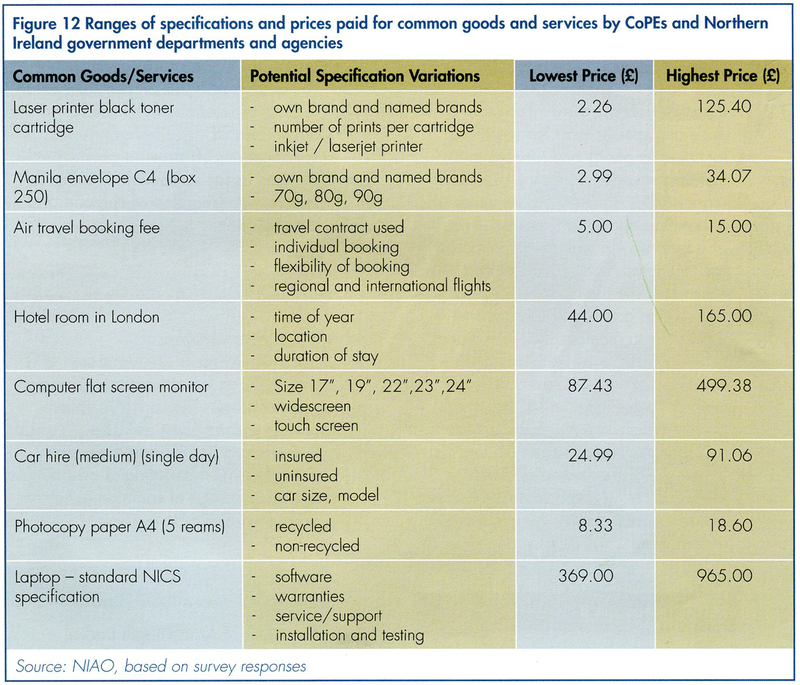 While the Northern Ireland Civil Service (NICS) pays on average £659 for a standard laptop. Some government departments, DFP and DARD, pay just £369 for the same laptop. However some ALBs paid twice and nearly three times more for the same computer – Public Records Office (£965), Arts Council (£852) and Construction Industry Training Board (£797). While NI Water paid £87 for a computer monitor, some ALBs paid nearly five times as much – NI Screen (£499) Armagh Planetarium (£332), PRONI (£255). “It is clear from our survey that wide price and specification variations exist for common goods and services and that departments and most procurement organisations do not compare prices of common goods and services. “It has also been shown that when contracts are mandated, price variations can be minimised. “The use of agreed contracts for common goods and services is paramount to promote competition and eliminate large price variations. “If collaborative procurement is to be fully effective in Northern Ireland, it must be underpinned by effective policies on improving collaboration and aggregating demand for common goods and services. “To date there has been no pan-government collaborative procurement strategy. “In our view, the recent proposals to improve collaboration and aggregation at CPD are modest. In England £655m has been saved by collaborative procurement since 2010, in Scotland £95m in savings has been achieved while the Welsh assembly plans to save £200m in 2011/12. However auditors expressed disappointment that Northern Ireland only plans to save £30 on collaborative procurement between 2012/15, representing a saving of just 1.1%. “This target is lower than those in the rest of the United Kingdom.